Irish Wedding Rings are renowned globally for their delicate and meaningful design. The Claddagh Wedding ring is a symbol of Love, Loyalty & Friendship making it the perfect display of your eternal love for another. The Celtic wedding ring has a beautiful never ending design which also coordinates perfectly with the symbol of marriage. The demand for Irish wedding rings has increased significantly in the last decade. Many people all over the world seek out an Irish Celtic ring made and shipped from Ireland. Our collection of Irish wedding bands include the ladies Claddagh wedding ring, gents Claddagh wedding ring, Irish sway wedding rings, Ladies Celtic Wedding rings and Gents Celtic Wedding rings. Each Irish ring in this marvellous collection is made to order so you will get a ring that fits you and your partner perfectly. The array of rings are available in 14kt and 18kt white and yellow gold and we have a selection of platinum Irish rings available. The rings are available to match in both ladies and gents so you will be perfectly matching on your big day. Our selection of Sway rings come with diamonds for that extra sparkle. Our rings are truly fabulous in every way. If that wasn’t enough, if you have a particular design in mind for your Irish wedding ring, please contact our sales department, who would be very happy to help you get the special ring you would like. 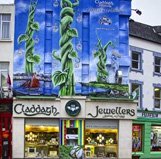 Claddagh Jewellers are the makers of the Authentic Claddagh ring ™ . We only use the best materials when making our Irish Wedding Rings. All of the rings in this collection are made by the finest Irish Craftsmen and shipped from Ireland. We endeavour to give our customers the best customer service possible and we ensure communication is made throughout before, during and after the purchase.